prostho – relating to prosthetic devices to replace or repair teeth and/or oral tissues. dontist – an oral health health care professional (dentist). A Prosthodontist specializes in that part of dentistry pertaining to the restoration and maintenance of oral function, comfort, appearance and health by the replacement of missing teeth and tissues with artificial substitutes such as crowns and veneers, bridges, dentures, and dental implants prostheses. Prosthodontists are diagnostic and treatment planning experts who commonly deal with complex cases, and coordinate referrals to other specialists as needed. Dental cosmetics, such as bleaching and veneers and the correct working of a person’s bite and jaw (TMD) joints are also in their area of expertise. Dr. Carpendale is a Canadian board certified specialist in Prosthodontics. He graduated from the Trinity College Dublin, Ireland in 1979, and practiced general dentistry for seven years before pursuing advanced training in Prosthodontics at Indiana University, USA. He received a Diploma in Prosthodontics and an MSc in Dentistry. His research thesis centered on the quality and fit of ceramic restorations. 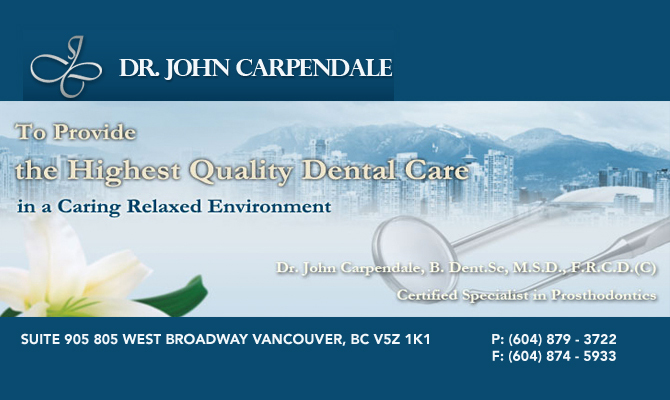 Dr. Carpendale maintains a private practice in Vancouver since 1990. He is a clinical assistant professor at the University of British Columbia School of Dentistry since 1990 and currently is Provincial Practice Leader in Maxillofacial Prosthodontics at the British Columbia Cancer Agency. Dr. Carpendale has spoken at international meetings, across Canada, and in Europe. He is actively involved in providing clinical courses and study clubs in advanced prosthodontics to local dental practitioners through Continuing Dental Education Programs. He is a member of the Association of Prosthodontists of Canada and the Canadian Dental Association and past President of Dental Specialists Society of BC and the BC Society of Prosthodontists.